The National Institutes of Health (NIH) and the United States Air Force (USAF) are listed as the agencies that gave the grant monies for the invention of atmospheric, radar chaff created from silk fibroin proteins derived from the milk of transgenic goats. The United States Army funded the development of the transgenic goats, who were given a gene from a web-spinning spider. This silk fibroin material is harvested from the milk of these transgenic goats. This must be a new kind of radar chaff, instead of the old, aluminum strips chaff. Over many years, the Air Force has dumped radar chaff in the skies of the United States. The below information was hacked off of the front page of the site. Nothing was hacked off of the front page but this information. We can only assume that it is important for certain parties that this information is not known by the public. “The Air Force & National Institutes of Health Funded Self-Replicating, Organic/Inorganic, Nanoscale – Macro-scale, Silica/Spider Silk/Polymer Advanced Materials That Can Be Used for Anything from Radar Chaff to Nano Fibers to Biosensors. Used to make fibers, foams, gels, films, or crystals. They can put almost any biological thing – drug, germ, antibody, hormone, gene, etc. into these advanced, nano-materials. These advanced, nano-materials can be used for microelectronic devices. The patents also talk about a crystallization process that can happen in vivo – after implantation. Let’s call these… Radar Chaff #1 and Radar Chaff #2. The Above Radar Chaff Patents use Silk Fibroin farmed from the Milk from the Army’s Transgenic, Spider Goats. Who is investigating Morgellons? The National Institutes of Health and the Army Institute of Pathology are investigating; they own nanotechnology patents, and they can’t seem to recognize nanotechnology when they see it? Are we paranoid to be worried about Frankenstein Science? Scientists farm the silk fibroin from the milk of the transgenic, spider goats. What if the spider or the goats have a parasite or weird germ? Could the parasite or germ replicate due to being further incorporated into an organic/inorganic, self-replicating advanced material? For about 14 years, the public has been reporting that planes are spraying some kind of substance that comes down from the skies and looks a lot like spider webs. Let’s find out if these spider silks have ever been used as chaff over your town! It is advised that all interested persons send FOIA requests to the agencies and educational institutions listed in the patents regarding “fibrous protein fusions,” “silk fibroins,” or “organic/inorganic composite materials made from spider silks” that might have been used as chaff by the Air Force or any federal contractors using federal monies over any part of the United States during the past 14 years. Federal monies were used to develop this chaff, so even the universities would probably be required to honor an FOIA. The General Accounting Office might also have information in regards to any such expenditures. This link will help you do a FOIA request. It has sample forms that you can use. Usually, the processing fee for a search for government documents is free if you are not using those documents to make a profit. Let ExoticWarfare know if you get something of interest. Chemtrail activists who study the webs that fall from the sky have noticed that these fibers will fluoresce different bright colors when a UV light is shone on them. As an example, spider silks have been developed in China at Tongji and Shanghai Jiaotong Universities that strongly fluoresce in the near-infrared band when the fibers are coated with certain types of nano-crystals and macromolecules. When you read this material, realize that ExoticWarfare is not implying that the named inventors have anything to do with what the Air Force or any other branch of our military is spraying in our skies. They just developed these spider silks. The military has its own laboratories. Goats are prone to nematodes. Wolbachia, a bacteria, is prevalent in spiders used for laboratory purposes. Wolbachia causes sterility in the males of the spider species. They took a silk protein gene from a laboratory spider that could have been contaminated (we hope not) and put it into some milk goats that could have been contaminated (we hope not). Then, they harvest the silk proteins from the goat’s milk and turn it into lots of things. Air Force chaff is just one product. Along with farming those silk fibroins, could they be accidentally harvesting genetic materials from nematodes, Wolbachia, germs, or other parasites? “Wolbachia is a genus of bacteria which infects arthropod species, including a high proportion of insects (~60% of species). It is one of the world’s most common parasitic microbes and is possibly the most common reproductive parasite in the biosphere. One study concludes that more than 16% of neotropical insect species carry this bacterium and as many as 25-70% of all insect species are estimated to be potential hosts. Outside of insects, Wolbachia infects a variety of isopod species, spiders, mites, and many species of filarial nematodes (a type of parasitic worm), including those causing onchocerciasis (“River Blindness”) and elephantiasis in humans as well as heartworms in dogs. Not only are these disease-causing filarial worms infected with Wolbachia, but Wolbachia seem to play an inordinate role in these diseases. A large part of the pathogenicity of filarial nematodes is due to host immune response toward their Wolbachia. Elimination of Wolbachia from filarial nematodes generally results in either death or sterility. One might infer from the paragraph above that Doxycline is the treatment of choice by medical professionals for nematode parasites in humans. Spiders, goats, and people can all get nematodes. There are many patents that are associated or related to the four patents below. Below is the main patent for spider silks that can be used as chaff harvested from goats, another patent for recombinant (cloned) spider silks, a patent for a coating for that chaff, and the patent for the transgenic goats that produce silk proteins in their milk. “ In another embodiment, the underlying template (e.g., fusion polypeptide formed into a film etc.) can be removed or etched away to generate porous networks, tubes, or lamellar sheets of inorganic material. If you do a search on world and U.S. patents for a “Kaplan, David L.” – you will find 118 patents on 3 pages where he is either one of the inventors or mentioned in other inventors’ patents as a reference. Probably not all of these patents are the exact same David L. Kaplan, but many of them are the co-inventor of Army goats who works at Tufts University. Right here is that search. Some of the former bacteria have been implicated as being factors in Morgellons syndrome. We saw discussion in one patent about the method for creating a trademark symbol on nano-scale devices. Objects coming out of the skin of victims have been found that had symbols on them. Watch the below video to the end to see the symbol on the object. Is it an odd artifact or a maker’s mark? Chitin is used in industrial applications for treatments of surfaces. It has been approved by the FDA for use in medicine for drug delivery, bandages, and it helps stop bleeding. It is used in agriculture and water filtration. Dr. Kaplan and his team have developed a way to make cellulose-chitin and cellulose-chitosan through biological synthesis that avoids using harsh chemical extraction methods on crustacean exoskeleton waste. This quote from a United States patent that was co-invented by Kaplan gives us a good idea of the kinds of various silks that are the focus of most of his team’s patents. Advantageously, the silk-fiber based matrix is comprised solely of silk. Another United States patent of Kaplan’s, #7,674,882, was funded by the Air Force and the National Institutes of Health and is a method for the production of electrospun, nano-scale, silk fibers. Metalized spider silk is ten times stronger and could be potentially used for super tendons and super physical strength for super soldiers. …and other agencies funded much of this research through the University of Illinois, Tufts University, Massachusetts Institute of Technology, Boston University, and other universities. It may be that most of these inventions are only used in consensual medical applications or for other legitimate purposes, but knowing that the Air Force and the National Institutes of Health have an proprietary interest in spider silks developed for radar chaff that uses spider silks from transgenic goats that were invented and are owned by the Army is disturbing. These fibers can used in electronics or electro-magnetically resonated. The researchers sprayed gold-based metamaterial structures directly on pre-made silk films with micro-fabricated stencils using a shadow mask evaporation technique. According to Fiorenzo Omenetto, the research team likens the concept to “a very peculiar kind of antenna” – actually, a lot of small antennas that behave as one. The silk metamaterial composite is sensitive to the dieletric properties of the silk substrate and can monitor the interaction between the silk and the local environment. Spider webs could possibly conduct an electrical current through ionic conductivity when wet, and certain parasites in the animal world have been able to create or control certain behaviors in their hosts. Factor in that present day communication systems can wirelessly send electro-magnetic signals to pretty much any point or area on earth, even if you have to hop those signals from node to node. It has been demonstrated that carbon nanotubes can receive radio signals. There are two more patents that are interesting that have to do with radar chaff and silk fibroins. The inventors are Stevens and Sturm. One of their methods is to take a spider silk and coat it with aluminum. The assignee is Alliant Defense Electronic Systems. There is a statement in each of these patents that is telling in regards to spider silk chaff. They state that spider silks will degrade over time from ultraviolet radiation. They also state that silk in quite flame resistant. “Silk is also a natural protein. The majority of commercial silk is obtained from the cocoons of silkworm caterpillars, although in a few select applications, silk from spider webs is used. Silk is a hygroscopic material that is quite flame resistant. It is tougher than cotton, and has a strength similar to that of nylon or pure iron of equivalent weight. Like wool, silk is very elastic. “In this respect, the persistence of aluminized glass fibers after settling to the ground and the perception of respiratory or digestive hazards of these materials has limited the open air dissemination of chaff for testing and training. Ranchers and environmentalists, particularly in the Midwestern U.S., have objected to chaff because it is carried uncontrollably by the wind and settles on populated areas or on land grazed by wildlife and livestock. Additionally, the United States FAA has experienced difficulties in monitoring air traffic because of the electromagnetic noise associated with drifting chaff. Though Alliant Defense is obviously a military contractor and the assignee on the patents, nowhere on the Stevens or Strum patents is the government listed as having an financial interest in these patents. The military does not own the patents (like the Army, spider/goat patent), and there is nothing in the patents about being able to add a drug, vaccine, sedative, gene, germ or other substance to the coating of these fibers. “Additionally, the templates of the present invention can be used to deliver any type of molecular compound, such as, pharmacological materials, vitamins, sedatives, steroids, hypnotics, antibiotics, chemotherapeutic agents, prostaglandins, and radio-pharmaceuticals. Read these patents of Kaplan, et. al. They state that they can put different kinds of substances inside the coating or inside of the silk fibers themselves during creation. Stevens and Sturm also state in those patents that conventional chaff can interfere with weather radars. If the Air Force or Navy (they use chaff, also) is using radar chaff from spider silks, the chaff is still interfering with weather radars. In 2006 at the behest of constituents who said they were getting sick from the aerial spray, Senator Harry Reid contacted the General Accounting Office to find out what was being sprayed over the United States. He received this report from the GAO: “Environmental Protection: DOD Management Issues Related to Chaff.” In the report, it states that there has been public resistance to the spraying of radar chaff and that there are efforts to develop a degradable chaff. Notice it does not say what the substance is for the base material? Is it spider silks, since they degrade under UV radiation? Is the military buying and using the radar chaff produced by Alliant Defense, the radar chaff from the GAO report by Esterline, or are they using the lighter, more versatile, and degradable chaff that they themselves funded and in which they have certain proprietary rights? Explains it all doesn’t it? ExoticWarfare would like to apologize for stating on Exoticwarfare.com that Morgellons could be infectious. Upon further reflection and experience with this syndrome, we don’t believe that it is infectious in the traditional sense, but if it is connected with the atmospheric spraying of radar chaff, we have all been exposed to it. If these fibers cause Morgellons, we are in a whole lot of trouble. People with damaged immune systems would be the most likely people to present the syndrome first. Can these fibers be used to specifically sicken a targeted race or sicken one individual based on their genetic makeup? Can the fibers lie dormant in the body until activated? It seems an unethical program could use them for genetic experiments, biowarfare, or drugging the population. Would it facilitate the targeting of the population with neurological or radio weapons? What about the infrared or ultraviolet spectrum? Why are these fibers fluorescent? Are they color-coded to indicate certain substances are inside or on them? 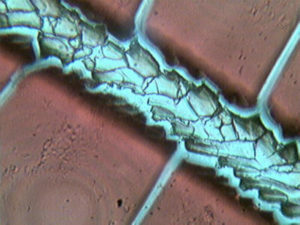 People investigating these fibers through magnification have even noticed some kind of signaling. Would the color of the fiber determine the frequency of the signaling? This brings us to the discussion of infrared signaling and infrared sensors. Is there anything else in the Kaplan patents that could possibly link photonic signaling and silk fibroin or silk fibroin/silica fibers? Yes, the patent below states that if you add very high amounts of glycine to the base materials or to the coating of the fibers they can function as infrared sensors or infrared filters. You can find that information in this patent assigned to Tufts, Kaplan, and Regina Valluzzi: SELF-ASSEMBLING POLYMERS, AND MATERIALS FABRICATED THEREFROM. “Because of its supermolecular order, the three-dimensional materials have enhanced infrared (IR) absorption compared to the polymers from which they are made. When the self-assembled material described above is applied to the surface of a device the IR absorption is enhanced. Considering the Pentagon has a pulsed energy projectile weapon (PEP – A Companion Weapon of The Microwave, Active Denial System) that generates plasma pulses by ionizing the air to a target by using an infrared laser, ExoticWarfare would like to know if the fibers implicated in Morgellons syndrome could receive some kind of signal from infrared pulses. The Active Denial System is to be used for crowd control. The PEP is meant to be used along with the Active Denial System for crowd control. These are incapacitating, crowd control weapons. The military has been dumping a lot of money into developing different kinds of laser and plasma weapons. You have an infrared sensor on your television that works with your remote to turn the television on and off. How would a PEP weapon effect people who have the fibers implicated in Morgellons growing out of their skin if those fibers just happened to have a very high glycine content making them infrared sensors? Can we find a way to see if these fibers respond to infrared light or infrared pulses? These are some interesting statements from the above patent. “ For example, in the environmental science and technology field, sensors can be used to detect the presence of particular materials in the air, water, soil, and other environments and media. In addition, in the medical and biotechnology field, specialized sensors can be used to detect the presence of specific materials in living matter, such as in plants and animals. . . .
Wow. They can detect “changes in the optical signature” of these sensors via satellite. Appendix II of the patent has information on “luminescent silk films.” The Air Force has rights in the invention. This invention converts a silk fibroin into a silk gel. The conversion is done by electrolysis with DC current and is reversible. This gel can be used as a coating for biomedical implants, biosensors, or silk fibers. The gel can be used as a delivery vehicle for substances inside the body, as a glue for attaching a robotic surveillance device to a wall, as a component of a biomedical robot, or for laying down silk fiber optic cables in the body. Wonder if one could remotely communicate photonically with these silk fibers? The invention was funded by the National Institutes of Health, the U.S. Army, and the U.S. Air Force. Are there classified patents? Our government has a history of experimenting on their citizens. Senator John Glenn stated in 1997 on the floor of the Senate that there are loopholes in the laws that are supposed to protect the citizens against experimentation by our government. He introduced legislation to close these loopholes, but it was not passed. In 2000 and 2003, U.S. Representative Dianne DeGette, introduced legislation on this issue that was also not passed. The military has had its fingerprints all over much of this history. There are strong indicators that the effects of electro-magnetic fields and beamed energy (info towards the bottom) are being tested on the public, and very recently, the EPA was forced to review and rewrite a policy that allowed non-consensual testing of pesticides on children. Radar chaff made from spider silks would get into people’s lungs. It would get into the water we drink. It would fall onto the crops we eat. Is the military spraying radar chaff that is solely and only for radar countermeasures? Lots of nasty questions. The second bit of news is about Dr. Hildegarde Staninger a industrial toxicologist who has done a lot of work with people who have Morgellons and/or who are victims of non-consensual experimentation with drugs, germs, or neurological weapons. She is based in California at a clinic called Integrative Health Systems, LLC in Los Angeles, California. The laboratory reports are not published in their totally, but she has paraphrased sections of the laboratory reports in her reports on the web. The reports do not say that the fibers are derived from transgenic or cloned spider silks – it mainly discusses silicon, silicone, metals, hydrogels, polyethylene fibers, carbon, and various other substances. 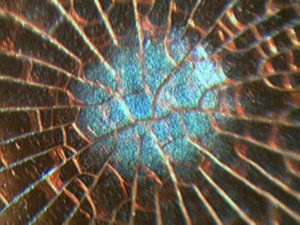 Kaplan and Lombardi developed a fusion material of spider silk and silica. Patent #1, above, is the invention. It would be nice if the original laboratory reports were actually available to see. She appears to be a brilliant and caring woman, and it may be that the laboratory studies that she had commissioned discovered some valuable information that is a part of the chemtrail/Morgellons puzzle, but there are some concerns regarding information about her past that was revealed in an old, newspaper article found by ExoticWarfare. The newspaper article that we think you will find very interesting is from a Florida newspaper, The Lakeland Ledger of Sunday, April 11, 1993. It is written by William R. Levesque, who won an award for his articles covering an agricultural, fungicide by DuPont called Benlate DF. Staninger is featured on page 1A and page 14A. It is a two-part article. The two-part article is very in depth about Dr. Hildegarde Staninger. Her married name was Hildegard L.A. Sacarello. The archived article was difficult to open in Opera, but opened just fine using the Mozilla Firefox browser. Sacarello is said to be 38 years old in the article from 1993 – that means she would be around 55 years old at this time. There is also a picture of her on the front page, 1A. Michael Sweeney was the chairman of the Department of Health Sciences at the College of Health at the University of Central Florida when Levesque wrote this newspaper article in 1993 in The Ledger. “On her resume, Sacarello also says that she is a clinical faculty member ‘housing 15 research products’ at UCF. The school did appoint her to the non-salaried position in 1984, a position that she held for about a year, Sweeney said. Read the article; there is more information from her resume that “raises questions” for Levesque. She did state in an internet interview on Rense.com that her degree was from Kensington. According to a recent article on CBSnews.com, “Top Officials Hold Fake Degrees,” Kensington University was closed down by officials at the state level in California and Hawaii. “4. Defendant KU is not now or never has been accredited by a recognized accrediting agency or association recognized by the United States Secretary of Education. You can read the state complaint and the default judgment against Kensington at this address. Staninger has also publically stated that she has two awards from the United States Army. These awards are also listed in her online biographical profile. We regret that we did not find this old newspaper article sooner and realize that we needed to track down more information about Kensington University. Exoticwarfare retracts any statement, verbal or written, that would imply that Dr. Staninger would be a competent professional to visit to document evidence of non-consensual experimentation. Please do a through search into their training and accreditation. Next → Next post: Why Do They Need “Viable Targets?” For Target Practice!